The start of the IZOD IndyCar Series' Honda Grand Prix of St Petersburg has been rescheduled for 10AM Monday morning as a large storm blows through the Florida area mid-afternoon Sunday. Race organizers, St Petersburg city officials, broadcast partners as well as the series made the decision at 3:30 PM on Sunday afternoon as up to a inch of rain coated the surface of the Florida temporary street course. IRL President of Competition and Racing Operations Brian Barnhart elaborated that standing water, track drainage, and potential driver visibility were reasons for the postponement of the race. "While our cars are equipped to run in the rain, we take the safety of our teams, event workers and fans very seriously. And with those conditions, even with the Firestone Firehawk rain tires and rain lights that we have, visibility would still be an issue." Barnhart commented. Unlike the NASCAR race at Martinsville Speedway, the IZOD IndyCar Series is faced with the fact they're running on a temporary street course incorporating roadways and part of an airport. For open wheel racing, past events with rain dampening temporary street circuits have resulted in some disgraceful black-eyes. The most notorious American open wheel event to be broken by wet weather was the Surfers Paradise CART race in 2002. A monsoon-like rain resulting in a 9-car accident made it impossible for the field to safety compete after a mere 8 green flag laps were run on the Australian street course. Because of the need to convert the circuit back to public roads by the last day, CART elected to run the field under the yellow flag for 30 laps in order to push the race beyond the halfway mark. Making for a ridiculous parade, the Surfer's Paradise finish was also marred with additional controversy. With the race distance marked at 60 laps, it was suggested that CART waited until lap 40 to call the event because they didn't want than halfway leader Michael Andretti to claim a victory. Andretti had than announced plans to run the competing IRL Series, this defection might have provoked CART to hold off on declaring the race finished until Mario Dominguez took the lead. In reaction to the postponement of the IZOD IndyCar event, Sao Paulo runner-up Ryan Hunter-Reay stated "This is probably the best turnout for the Honda Grand Prix of St. Petersburg we've ever had, so to have them all out here and have them go home and come back out tomorrow is a disappointment for us." Newman/Haas/Lanigan Racing's Hideki Mutoh supported the IRL/IndyCar decision saying candidly "If we were to go out and try to race, maybe there would only be one car that would finish." Predictions call for rain showers to continue into the morning hours of Monday but the IZOD IndyCar vehicles are equipped to run in light to moderate rain thanks to Firestone wet weather tires. ESPN 2 will air the race live in the United States. With the Honda Grand Prix of St Petersburg scheduled to be shown on ABC, the rescheduling to the cable sports network was an unexpected but unfortunate loss for the teams, drivers and sponsors in the 2010 IZOD IndyCar Series. 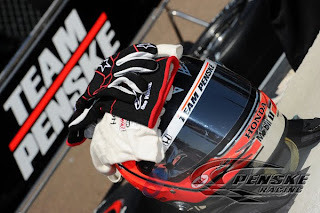 Weather permitting, Will Power in the #12 Penske Racing car will lead off the 24-car field.